Has winter taken a toll on your windshield with a crack or chip? There are probably only two things running through your mind right now: the time and the money that it will take to get it fixed. We get it! Yes, we understand how valuable time and money are, but those are not the two factors that you should be thinking about when deciding whether your windshield needs to be repaired or completely replaced. Location, size, severity/depth are the three main factors that can give you the best estimate of what option you should be taking to ensure that you and your family are safe on the road. If you are looking to cut down on costs and simply get your windshield repaired, the current rule of thumb for the size of a repairable-chip, is the chip must be smaller than the size of a quarter. If the damage is in the form of a crack or if there are cracks growing off of a chip on your windshield, they typically can not exceed the size of a dollar bill. If there is more than three chips or cracks it is likely that we will ask you to replace the entire windshield – for your safety. The first and probably the easiest way to detect whether you are in for a repair or replacement for your windshield is simply by the location of the damage. If there is any apparent damage that is in the line of sight for the driver, the space that windshield wipers cover, it is almost guaranteed that you will need a quick fix. This is the same for any damage that extends to the outer edges of the glass. In addition, with newer makes and models of cars, if the chip or crack is in the view/route of a sensor, such as a lane departure warning system or automatic brake system, most auto glass companies will recommend a replacement to eliminate the possibility that a repair will cause a malfunction in these systems. Finally, the severity or depth can also be an easy indicator of whether your windshield is able to be repaired vs replaced. A typical windshield consists of three layers: outer glass, inter-layer plastic and inter-layer glass. If the damage has punctured through both the inner and outer layer of glass it is likely that you would need to replace your entire windshield. We understand that this may need a professional’s eye to inspect, so give us a call and we can set up a time to check out your windshield! Remember, windshields are a big contribution to the overall strength of your car. It literally is the only thing between you and open road ahead. 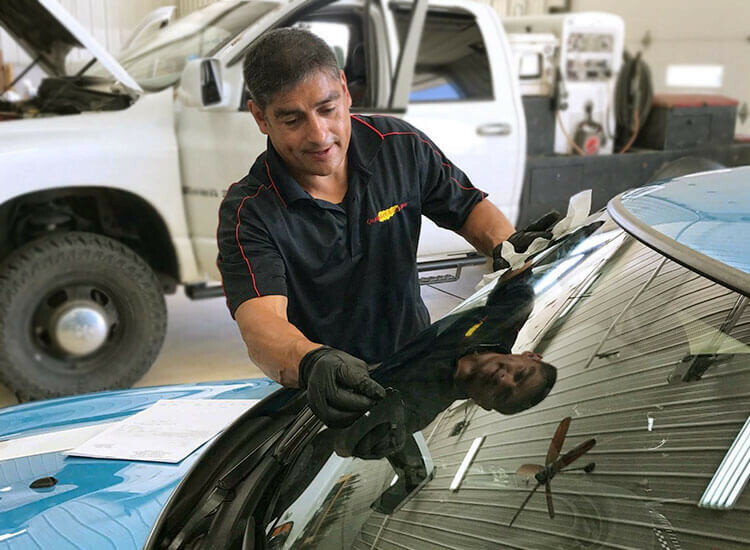 There is no “when” to repair or replace your windshield – it is simply your responsibility as a driver to keep your vision clear and everybody safe in and around your vehicle. Your best bet is to always consult with a professional at Quick-Set Auto Glass. From all of us here at Quick-Set Auto Glass drive safely out there!